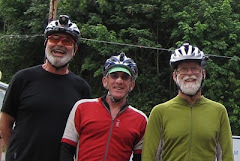 This morning after breakfast we immediately run into a organized group of bikers. We find out through conversations with them that they are doing a 7 day ride from Pacific Beach to Solvang. They had ridden the Big Sur stretch the day before yesterday in the rain and were not able to see much. What a tragedy. I will never forget riding along the Big Sur to San Simeon stretch when all of a sudden by a shear cliff a flock of 20-30 pelicans rises elegantly above the edge of the cliff no more than a few feet from us. Anyway, today's ride was fast at times and nerve wracking due in part to the strong winds; but also due to reaching urban centers where there wasn't a good alternative bike route (at least not one we were aware of). One short ride tomorrow and we reach our goal, Santa Barbara. Clear and sunny when we depart San Simeon. A quick breakfast in Cambria and south we head. The tailwinds are light but we expect them to build in the afternoon. 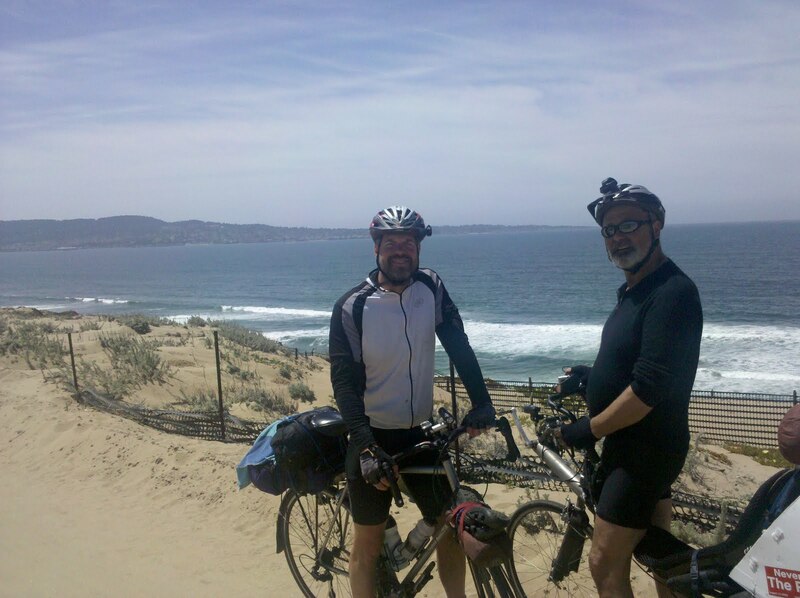 Before long we're rolling into Morrow bay and soon Pismo beach for mexican food. 55 miles down and 45 to go for the day. The winds have picked up and we roll at 20 plus except for the times the road turns west and then it is difficult to keep he bike upright. We get pushed and then we get buffeted alternately the next few hours. We ride past Vandenberg air force base and then to Lompocs motel 6. Rain while we're eating breakfast dampened our spirits; but all cleared up by the time we left. The most beautiful stretch of coast so far. We start the day expecting sun and find rain. 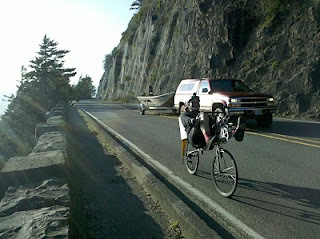 We start to roll and the rain stops and before we finish the climb out of Big Sur I've removed both vest and tights. The rest of the day is bright and sunny. Up and down the road goes. The views are amazing all day. We stop along the way to marvel at a beach coverd with resting elephant seals. Finally we roll into San Simeon and grab a large Mexican food dinner. As we head to the campground a rain squal hits and we opt for a 39 dollar motel. A rotisserie chicken. 2 pounds of grapes and two pounds of strawberries along with a half gallon of ice cream and many of Bobs cookies had filled us up so this morning we finish the salads we intended to eat last night. A quick stop at Safeway for coffee and a sandwich and we rode off into a strong headwind and rain. Our planned destination is big sur - 26 miles south. A rest day. Only two noticeable climbs and some rollers. It was the wind that made the trip memorable. 25 mph head winds which reflected off the cliff sides had us guessing which way to lean. We stop at he first restaurant for a coffee warm-up. Yikes 7.50 for two cups - gotcha. We stop at a campground - 88 for an unheated tent and two cots - ouch. We put on our sad wet faces and get a 150 motel room for 115. Had to do it - the map shows almost nothing for the next 74 miles. Bread, herring and cookies for lunch and prob. dinner. 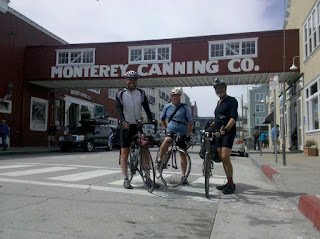 The wind and hills held us to around 3-4 mph much of the way here from Carmel. 25 miles of cold, wet, and miserable was enough of that. 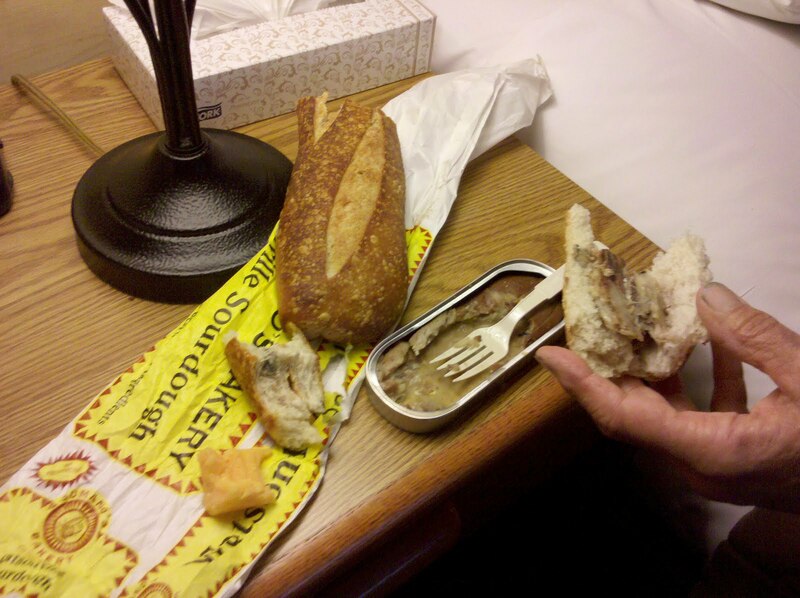 Bob's care package cookies, a tin of herring, hunk of cheese, and bread made our lunch. We're checked into the hotel by 1PM. Up and going by 8 AM. 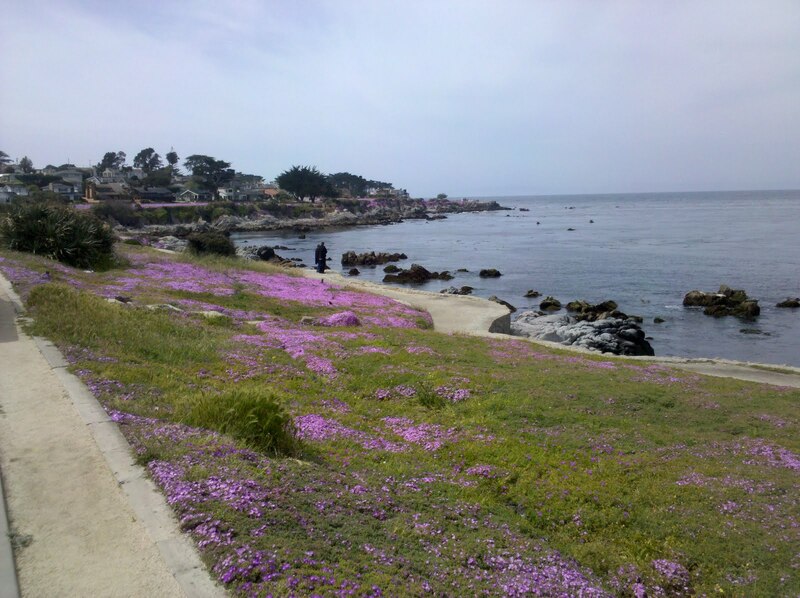 Reuben takes us for a ride thru thru the local waterfront suburbs going South towards our days destination around Monterey Bay and into Carmel where we have been told we have a package waiting for us at the post office. Once again we find ourselves short of 30 miles by noon. 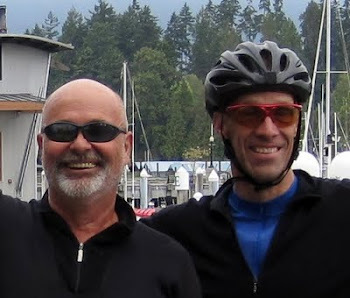 About 4 miles North of the town of Marina we are routed off the HWY and onto a paved bike path, A few miles later we meet up with our next, unexpected, and very hospitable tour guide, Larry. 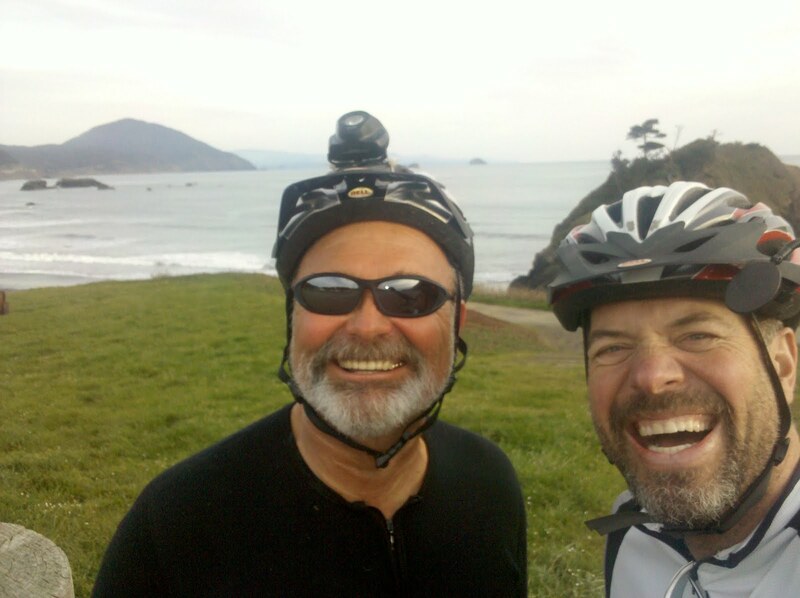 With Larry's proding we decide on taking the longer, scenic route to Carmel via the bike trail and the famously expensive and beautiful, 17 mile drive thru Pebbles Beach. 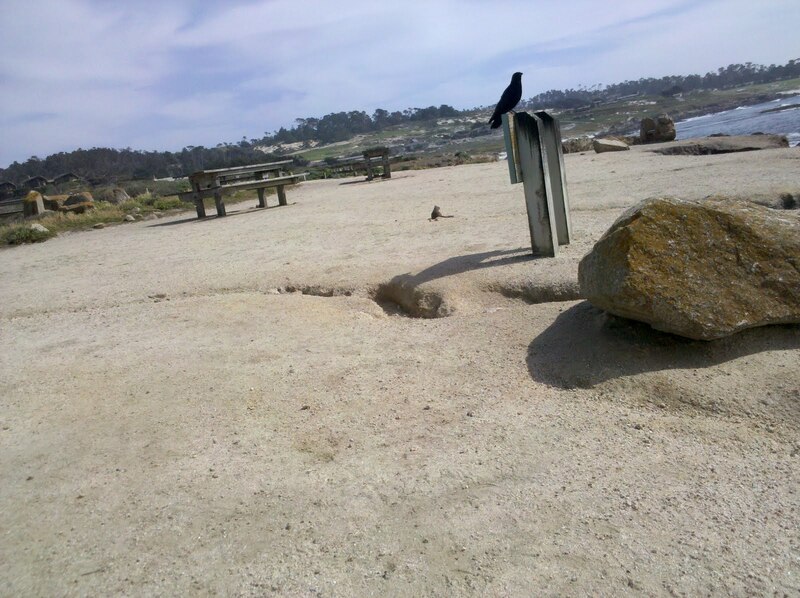 Larry patiently stays with us to his turn at Pacific Grove (about 15 miles all together). Along the route we see a couple of paragliders practicing in the bluffs above the Bay and next to the bike path, we see the wharf district,And of course the Bay with all kinds of blooming plants. We wake up on in a bamboo tiki lawn space on the last one acre waterfront lot in Santa Cruz. Reuben has a small backyard rental behind the owners home. Both the Reuben and the owner Danny are true excentric free spirits. Reuben is a carpenter who recently spent 2 plus years living in a vacant space along the river in downtown Napa. He showed us a newspaper article where he built a raft and pitched his tent on it and lived on lake Champlain while working back east. He only owns a bike and carries carpentry tools in paniers, and his calves are huge and he can ride. Danny is an artist working in redwood carted up from the beach as well as carving jade, though while we were there he was splitting beach redwood into grape stakes which he sold for 3 dollars each. Reuben had a job lined up in Watsonville which was on our route so he showed us an interesting route through the neighborhoods to the south. Up and down we went through what Tom described as worse than the blue ridge hill climbs. 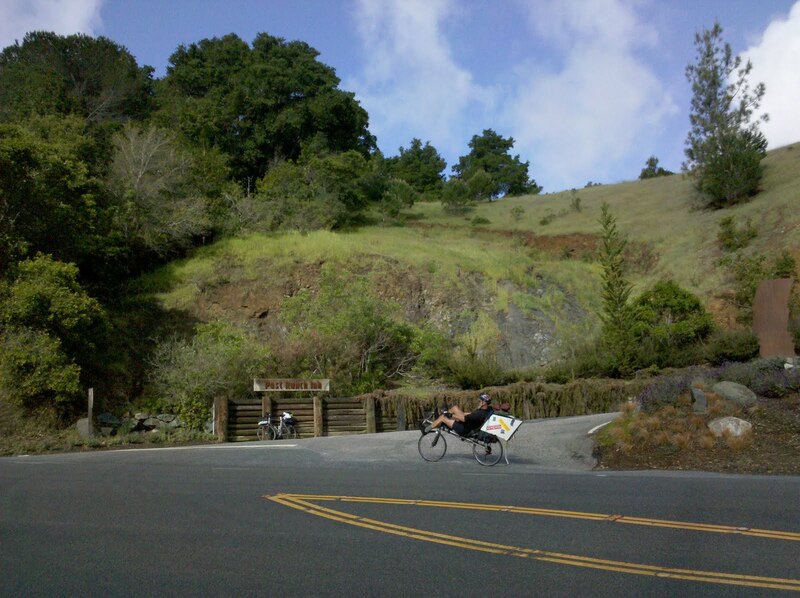 Then we carried our bikes around a locked gate to walk up a steep dirt road. Soon we were riding through a strawberry field. Reuben, thanks for the great adventure. 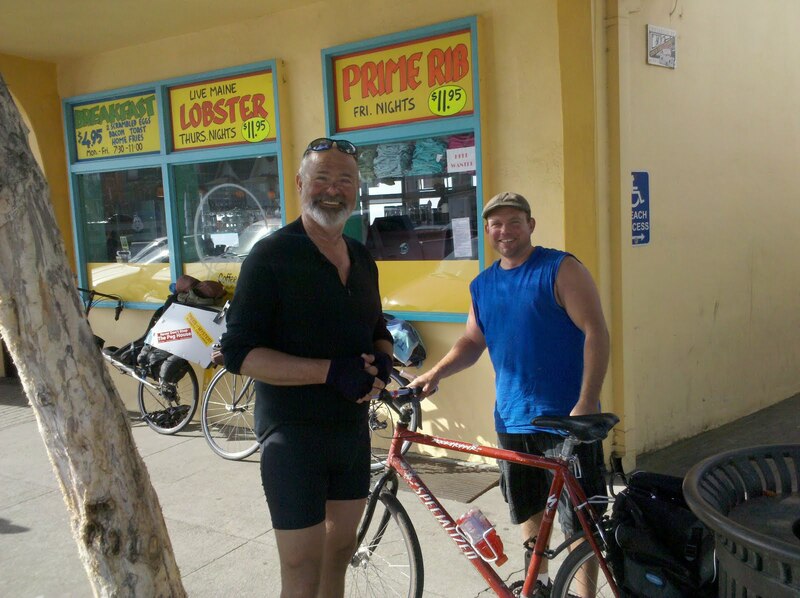 A lunch in Moss landing propelled us further down the road where we met Larry. He described the bike trail route to Monterey and on to the 17 mile drive. He ended up riding with us most of the way and described the area as we rode. He's a one man database programer who rides daily from 12 to 3. 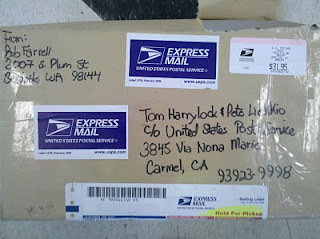 We hit the Carmel post office to pick up a goody package from Bob Farrell. We open the box while finally doing some laundry. Great cookies, thanks Bob. It's after 5 so while Tom watches the laundry I check out the area for possible places to camp out in the bushes but Carmel doesn't seem to lend itself to sneek camping. I can't find the bridge where Reuben has camped under so we opt for a motel. People would ask about our route especially around the SF Bay area. I would tell them that Pete had a plan. 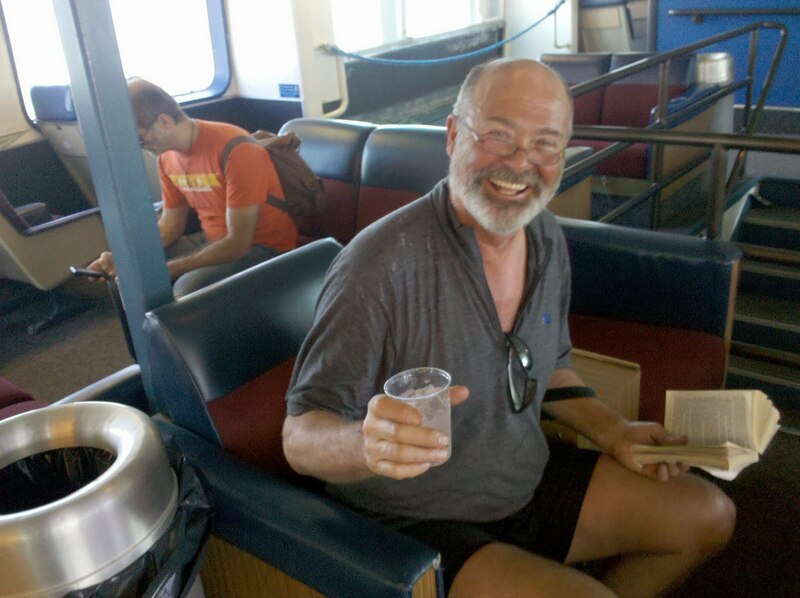 Little did I know that the plan was to ride a ferry, take a train to San Jose, and ride Metro to Santa Cruz and finally to camp in some guys yard we met on the train, Reuben. We left our impromptu campsite about 15 miles N of Pt. Reyes Staion at dawn. I noticed frost on the ground and Pete commented how fast I seemed to be able to pack when it is cold. I didn't realize it got that cold in CA along the coast. We rode to Lockspur where we caught the ferry to SF via San Rafael. From there we caught the Santa Cruz Metro. 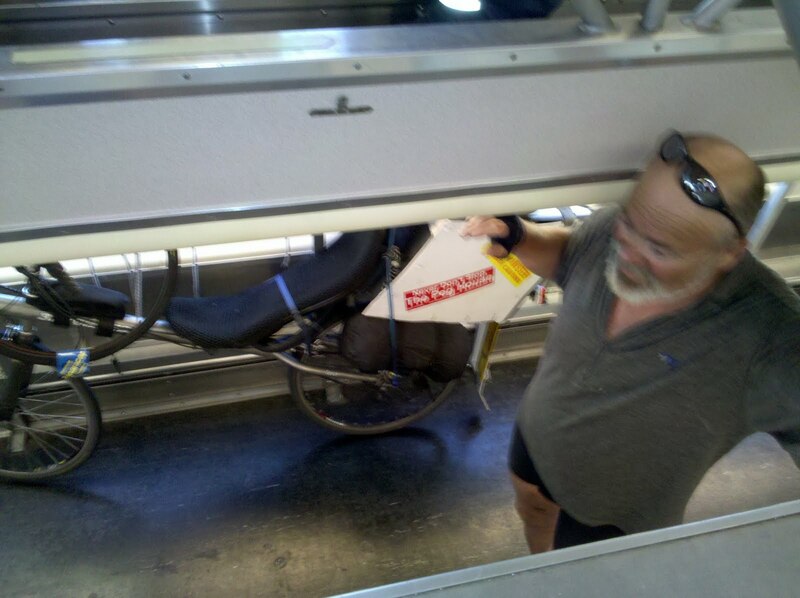 How Pete's bike made it safely to Sant Cruz with the big white box on back and a Metro driver that seemed determined to through the bike off with his wild driving, is amazing. Rueben kindly offered us a place to stay that evening and we found ourselves camping in Reuben's yard. We wake up next to the salt water slough and the dew has soaked and frosted everything. We share a banana and headed to Nicks for breakfast. We're 45 min early so we feast on the leftovers from last nights dinner; Triscuits, salami and cheese. I had eaten the last of my herrings during the previous day.Breakfast on the tomales bay helped but the mojo had left our legs. We struggled up each roller to Pt Reyes where we had a nice breakfast on the patio. 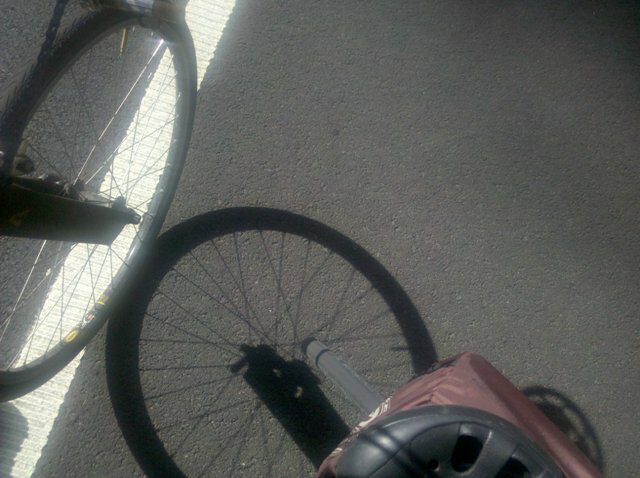 We roll to San Raphael to get me a new spare tire at the performance bike shop. We grab a tire and we notice that a close by ferry leaves Larkspur for San Francisco. On the way to the Ferry Tom has two flats so we finally catch the 3:40 boat. we realize that the ferry docks a few blocks from the Caltrain station so we decide to evaluate the local transportation system further by taking the train to San Jose. We meet a fellow biker who shows us the bike car and lets us know there is a bus to Santa Cruz so we decide to further study the transit system. 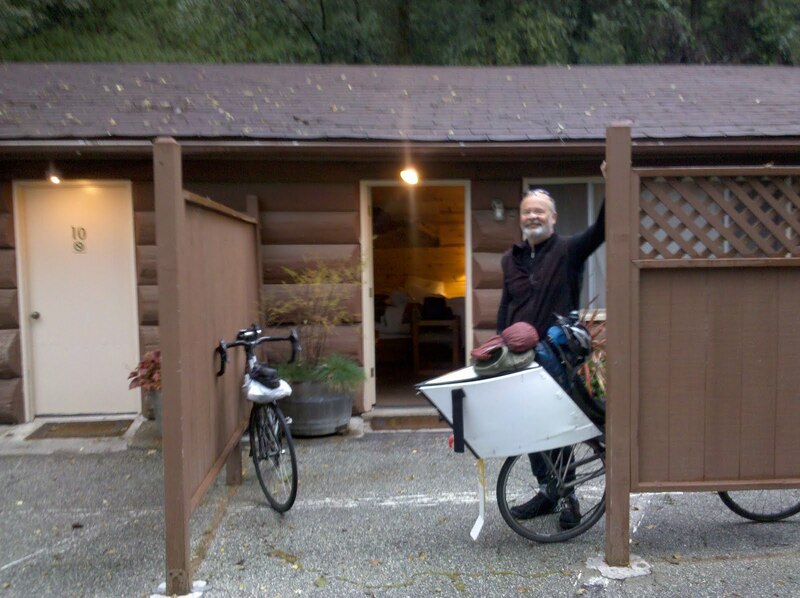 He, Rueben invites us to spent the night at his place in Santa Cruz. An hour before dark we found ourselves totally exhausted, miles from anything resembling a town or campground with two dead smart phones. We had come closer to the big city and had to find a way thru the urban center and on our way down the coast. Options were myriad; but which would come with hills, which would be flat? We wake upwhile refreshed and quickly get pushed south by a great tailwind. So good that we make 48 miles before noon. Yeah that's not so much but we've been joking with each other because our breakfasts are so leisurely that we only occasionally make 30 before noon. The ride continues with many rollers and by late afternoon we are feeling sprinting the earlier climbs and then we get hit with a big climb just before Jenner. Still confident we can do 96 plus miles we roll through Bodega Bay stopping only for chicken strips. We were told that it was flat to Pt Reyes but up we climb and soon we realize we're ready to stop for the night. We stop at a small grocery and the owner says we can make camp by the side of the road a few miles down. Great but our bath will need to be in the salt water bay. We're resigned to a salty cold cleanup. As we were leaving the town I noticed a business that was closed for the day so their hose proved to be a nice shower. Washed up we rolled a few miles and slept at the side of the road at a fishing access. and a can of chili on bread with salami for dinner. Musings - a slower pace allows one to ponder things going by. We followed the Eel River up along it's South Fork from where we broke camp near its mouth in Fortuna. 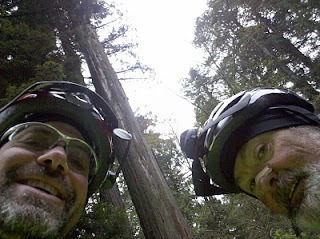 Much of the day was spent in the "Avenue of the Giants". I know I've driven thru here before, but everything seems different on a bike, it gives you time to ponder the age and beauty of these trees. It was a majestic. The day ultimately brings us to the upper portion of what had been a large mighty river miles back and now is diminishing to a large stream. Day 10 will take us over a pass and away from the river. I will miss the rive and experiences along it. We wake with sun under the Best Western sign. Not the best campsite but the showers were hot. Breakfast was at a gas station Subway. The rest of the day we follow the Eel river up and into the avenue of the giants - a quiet 32 mile section of road which parallels the freeway. Hot in sunny sections but cold in the shadow of the giants. Following the river keeps us climbing all day. We grab sandwiches in Garberville to carry to our campsite 20 miles up the road. Tom favors the beast - roast beef, while I grab the big bird - turkey. After a fe good climbs we arrive at our campsite, do laundry and crash. No rain, tailwinds and amazing scenery. We begin in Klamath at a motel run by a very friendly and helpful manager. He suggests the place across the street for burgers and suggests that the double patty one is for really big appetites. Of course we order the double. Turned out to be 8 ounce patties and we successfully finished them along with the garlic fries. Lots of garlic even for me. The morning was overcast and cool but there were tailwinds - yay! I remembered the steep climb ahead but it went easy since I also remembered the 5 mile descent through the redwoods to Elk prairie. Just as amazing the second time. Light morning fog, dark green redwoods with scattered moss covered maples and new leaf green alders standing like supplicants among giants. Just after Orick a herd of over a dozen elk crossed the road not 50 feet in front of Tom. Just could not push the camera buttons fast enough with my gloves on. The males were in their spring velvet antlers. Big tailwinds, long rollers, big bays, windblown surf and we roll into Eureka for all you can eat Mexican. We ate well. From there we made bike shop calls. I had not tied down my spare tire well enough and it is lying somewhere among the redwoods. Could not find the right size so rolled on. Of course a few miles down the road I had my first flat. 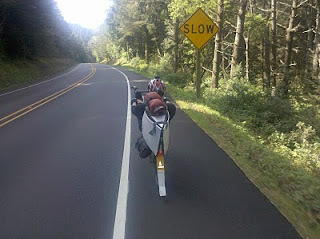 With a major tailwind we rolled at 22 plus to Fortuna for the night. We ate too well at the Eel river brew pub and slept at an RV park under the bright security light and sign of the next-door Best Western. What a day. Finally we have a flat tire -1st one of the trip. 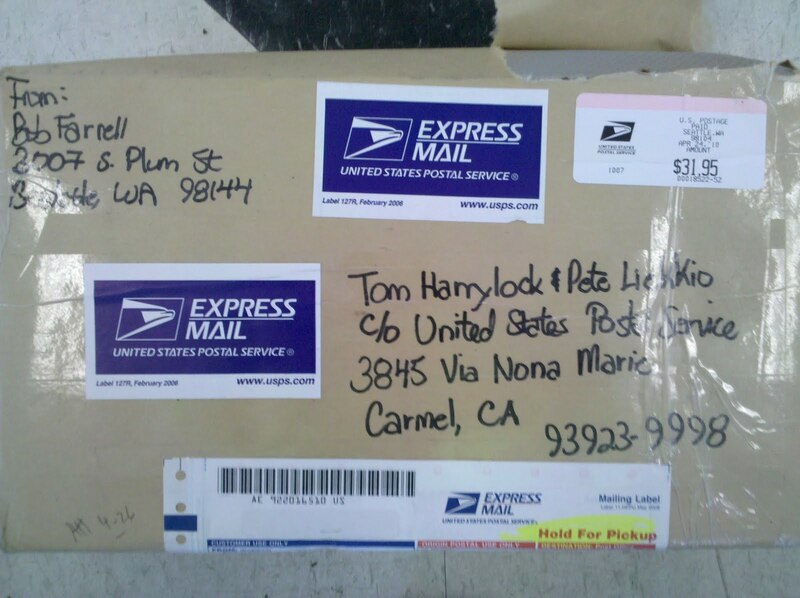 Pete got a flat in Arcata, CA. We have a tail winds and are rolling at about 18-24mph on the flat without much effort. We started the morning out in Klamath. 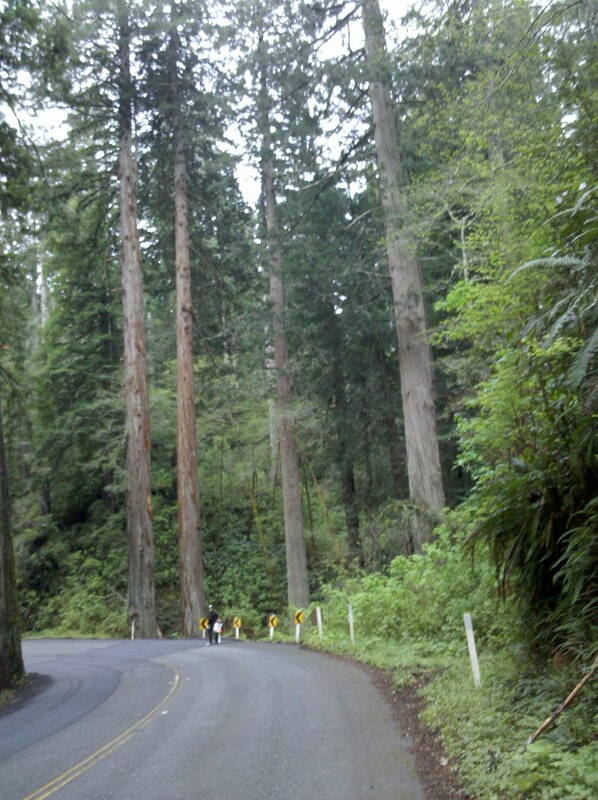 From there we headed through the Redwoods again. 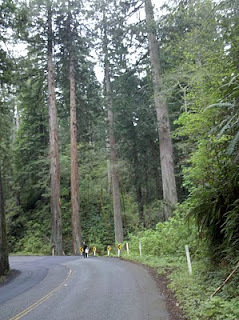 The trees were spectacular, The side road we took was not crowded. While Pete changes his tire I found a nice quiet place to write this blog entry. We hope to be in Fortuna CA this evening. Well guess what, I got a flat as we've rolled into Fortuna. As I took the inner tube out and found the hole, Pete looked at it and said the puncture looked like it came from one of those little wire cables that come off car tites....sure enough there was a small wire stuck to the tire at the site of the puncture. We're camping at the RV park underneath a Best Western Motel sign next to a road. Hope we get some sleep. Ok I'm a wuss. The weatherman was finally right. The rain has arrived. We late started from Brookings then delayed some more to facebook. Starbucks in Crescent city was nice though the leather couch was more than damp when we left. Tom had his lunch there - a frosted donut and a pink frosted cupcake. Never knew he had such a sweet tooth. I warmed up with a bowl of clam chowder down the road. The winds finally shifted to northerlies but the temperature also dropped. The hour climb out of town warmed us up but the decent cooled me down too much. Redwoods and coastal surf views makes for a a great day. Soggy we were when we rolled into the trees of mystery for a short break. I warmed up while tom downed some taffy. A quick roll in the rain brings us to Klamath for another night in a motel. A very short wet cold day. To weather the storm and come out the other side is a beast I am well acquainted with (as opposed to the headwind "beast" we experienced yesterday ). After riding in the rain with the temperature dropping the whole way from Brookings , we were cold and soggy. We stopped at the local Starbucks in Crescent City around noon and had a warm coffee (with an old fashioned donut and cupcake for me). As we were leaving town Pete found a restaurant and had a bowl of chowder. I took the opportunity to change into dry socks and gloves. That felt much better and I was ready to tackle all the elements being thrown our way including the biggest climb of the ride to date. We came off the descent carefully and there at the bottom was the most beautiful scene for the windsurfer in me - a beach with 6' breakers and wind spraying the surf all over. It was a scene that made me sing "How Great Thou Art" and thank God for this wonderful day. We left the run down Shoreline motel and headed for the Paradise café. Nice homefry scramble special. 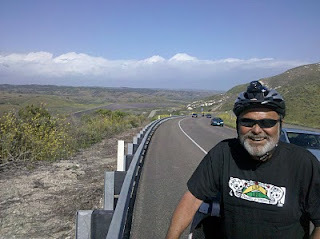 Of course after yesterdays easy ride the winds were back today though the promised rain is still holding off. 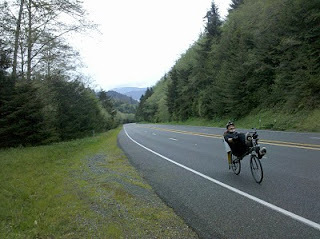 Rolling hills, great ocean views, headwinds, and 3 hours bring us 26 miles to Gold beach for a nice bowl of salmon chowder at noon. Fifteen miles later we stop for a break on a wind swept crest and decide we're hungry again so we polish off a can of herring, a block of cheddar and a chunk of salami. The ride has been just as difficult as two days ago and Tom comments with a smile that he conquering the beast this time. That's the way with the beast. Once you meet it and recognize it, the easier it becomes to ignore. I've known the beast for a long time but by a different name. I've always referred to it in my mind as the lows. Biking for me is mostly highs, but occasionally the lows show up. Early on during the ride Tom refered to a book he recently read about ultra marathons - "Born to run" by christopher McDougall . One of the characters refers to figthing the beast. The description of the beast was the same as what I had been calling the lows. During a difficult physical event the pains and discomfort can case doubt to occur in ones mind. This discouragement and wish to quit is the lows/the beast. The interesting thing is that the more times you meet the beast the easier it gets to beat it. When you recognize that the problem is in your mind you can defeat it. A short break, some food, and maybe some advil and the beast is gone. We roll to Harris beach campground and check the weather which is not encouraging so we go on to Brookings and a motel. Bread, rotisserie chicken, and romain lettuce, is dinner. Strawberries and Dairy queen ice cream makes a nice dessert. Today we had a good time rolling up and around Humbug Mountain, by the cheesy dinosaur park, past my favorite town, Gold Beach, and then over Cape Sebastian, and by one of the world's best windsurfing beach at Pistol River. 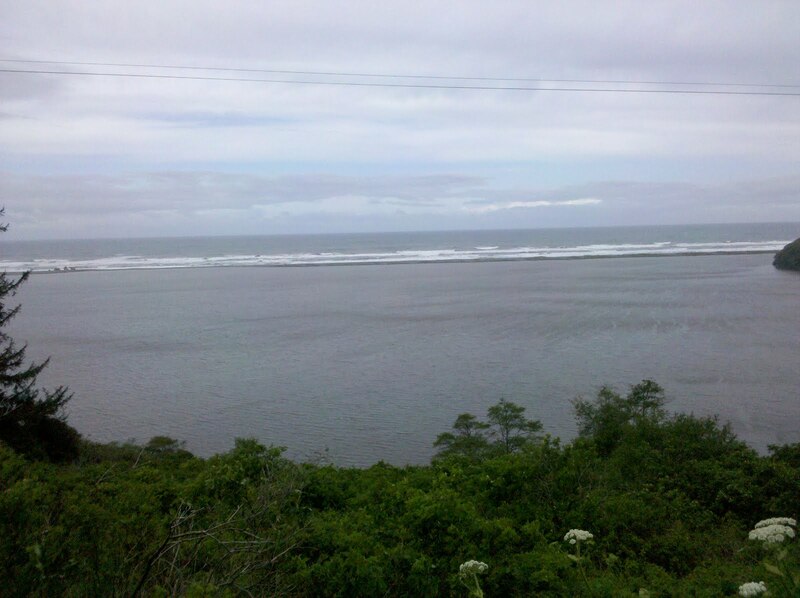 Years ago I spent so much time here chasing both the perfect wave and wind @ Pistol River - great memories. 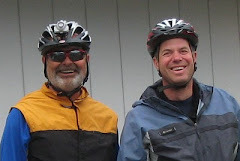 After the hardest 50 mile ride in my life, Saturday (headwinds at 25 knots sustained), with Pete telling stories about even stronger winds riding over the pass to Ellensburg, we didn't wake up until 8:30 (we went to bed at 9:00PM. We woke up to calm and sunny conditions. Pete had promised a break that morning but couldn't wait and said he'd meet me at Starbucks for breakfast (slave driver). 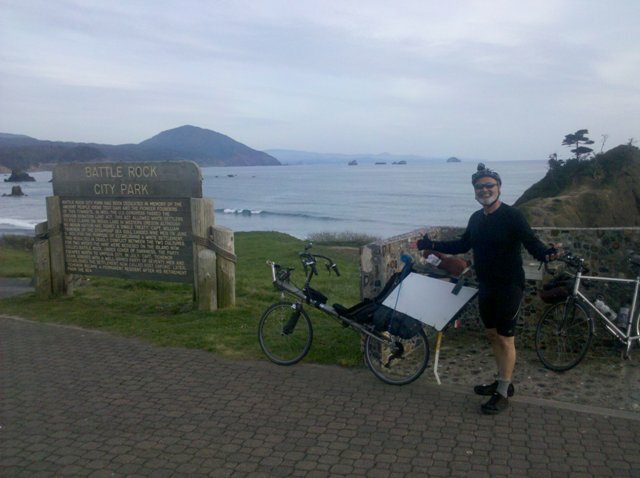 99 miles and 9hours later we arrived in Port Orford. 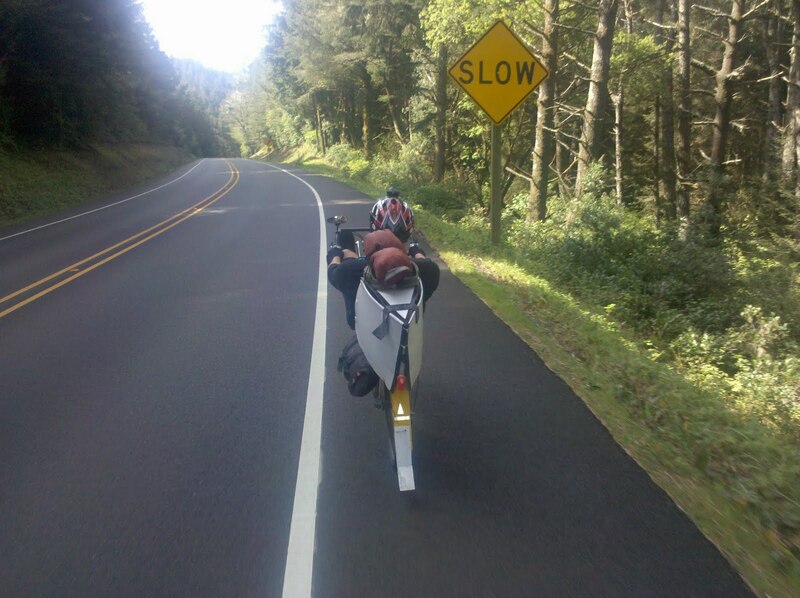 Douglas County,Oregon had the smoothest asphalt. All the other counties are using chip seal which rattles you. I took a picture of this wonderful road material. I only find a little rest going up hills. A recumbent bike doesn't do to well on these. Woke up with the sun at 6:30. Here it is now noon and we've gone 29 miles. The beast and the breeze are both strong today. It is a good thing that road is the level And we are in the trees. After 9 hours we finally arrive in Florence. Motel, laundry, dinner crash. Oh how nice is a hot shower We're at B Bch campground after all day in the sun. 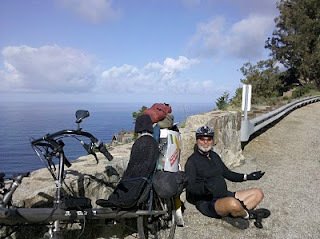 We had a VERY refreshing breeze in our face all day and had two nice climbs. This morning found us stiff and taking regular turns battling with the beast (more about the beast later). We struggled for 45 miles to Hebo where John headed east toward Salem to catch the train home. It turns out that he made over the coast range and aided by a tailwind made it all the way into Salem. Nice ride. 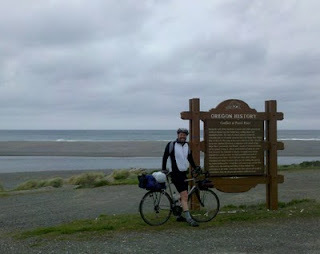 Tom and I fought the beast and the headwind to Neskowin where he stayed on the 101 and I took the recommended by a passerby 5 miles longer more scenic and much less climbing route. Toms route was 2 miles at 7-8 percent an 2 down. Mine was 4 miles at 2-3 percent and 2 at 6-7, hmm I should have remembered that cars really don't notice hills. Yes more scenic but prob. more climbing and 5 extra miles. After meeting up at Starbucks, both of our beasts were gone at we powered the last 20 miles to B bch campground. So soon the honeymoon is over. Our motel has a kitchen so we decided to make breakfast and John came back with blue bonnet instead of butter. 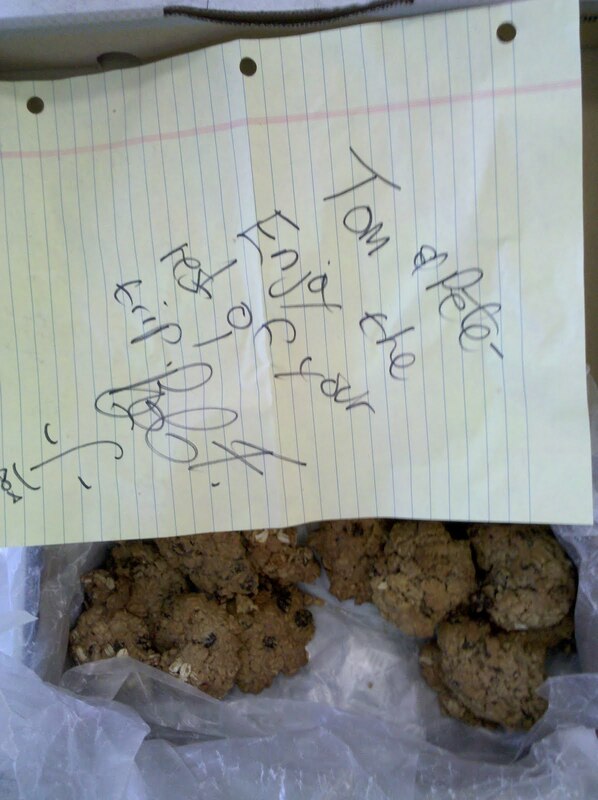 And then Tom went and pealed the potatoes before frying.